It is a widely known fact that in order to receive the most clicks on search engine results pages (SERPs) merchants need to aim for the first page. However after the latest study by seoClarity it seems as though on mobile devices there is only one position that is receiving consisten clicks. The study analyzed more than two billion impressions and more than two million clicks collected during a 90 day period from approximately 400 Google Webmaster Tools accounts. SeoClarity found that while there is a difference between the percent of clicks each of the first five position receives (19.3, 11.4 7.7, 5.2 and 4.1 percent respectively) the decrease is steady and consistent throughout all five. However, on mobile SERPs there is a drastic difference between not just the first and fifth result but between the first and second results. On mobile devices the click through rate for the top five search results are 27.7, 9.2, 3.9, 6.7 and 4.8 percent respectively. With almost a 20 percent disparity between first and second place on mobile SERPs it is clear that just being on the first page, or even among the top five, is not good enough on mobile SERPs. 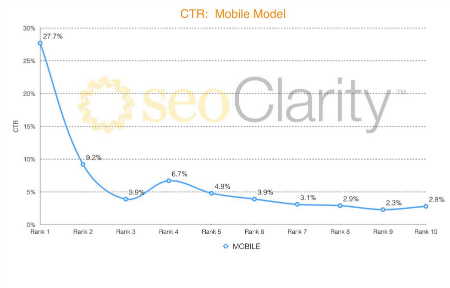 In order for merchants to receive consistent clicks on mobile SERPs they must hold the top position.